National guardsmen fired on a crowd Sunday in eastern Ukraine, where voters were lining up for a disputed referendum on whether to split from rest of the country. An insurgent leader was quoted by the Russian news agency ITAR-Tass as saying that there were fatalities. 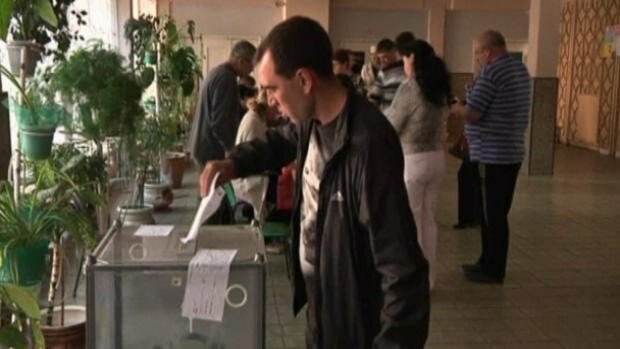 The Associated Press reported that one of its photographers witnessed the shooting, in the town of Krasnoarmeisk, where dozens of guardsmen had shut down voting earlier in the day. The photographer saw two people motionless on the ground, the AP reported. Eastern Ukraine referendums seek approval to declare sovereign the Donetsk and Luhansk regions, where armed pro-Russia insurgents have taken control of government buildings and clashed with Ukrainian troops.